Here comes the future — not with robots, but with Solar Panel Installers. 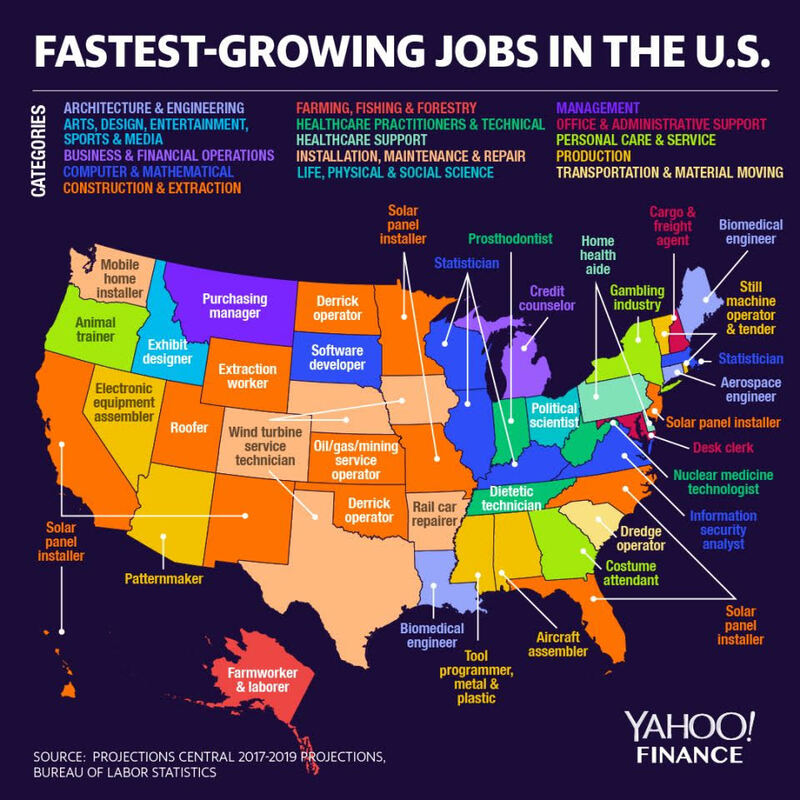 That is the fastest-growing job in 8 states (California, Florida, Hawaii, New Mexico, North Carolina, Missouri, and surprisingly, Minnesota and New Jersey). The gig pays ~$19 per hour or $39,5k per year, and is projected to grow 105% til 2026– much faster than the national rate. Other clean energy jobs include Wind Turbine Technicians in Texas, Colorado. Nebraska and Iowa. No word about coal . . .
Also of note: Statisticians in Massachusetts, Illinois, Kentucky, and Wisconsin. Good to see big data and number crunching have a future. Yahoo Finance used data from the Bureau of Labor Statistics (BLS) and projections from the government-backed Projections Managing Partnership (PMP) to create the above map, ordered by growth rate . . .